Beyoncé Knowles should be ashamed of her involvement with Pepsi’s Super Bowl halftime show photo contest ripoff. She’s probably not, though, so I’m hiding her face for her. Pepsi is running a Super Bowl halftime show photo contest ripoff designed to obtain free photos for use in Pepsi ads, including a Super Bowl commercial. The contest page is Halftime.Pepsi.com and I personally question whether the contest is actually even legal (more on that in a moment). To enter Pepsi’s Super Bowl halftime show contest, you submit a photo of yourself which meets a set of various criteria listed for the particular day on which you enter — a photo wearing sunglasses and shouting, shouting with your arms raised, shouting with your arms down, things like that. 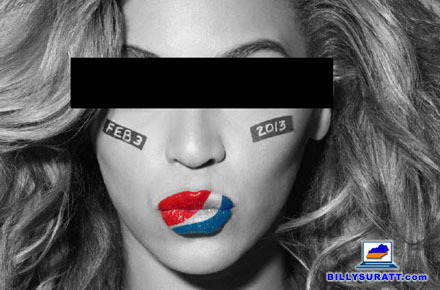 The sweepstakes portion of the contest is quite appealing, offering the winner and a guest round-trip airfare to New Orleans for Super Bowl XLVII, four nights in a hotel, a chance to participate with Beyoncé during the Super Bowl halftime show, access to a private Pepsi Super Bowl party and $500 spending money. Estimated retail value is $7,000 and it looks like a fun contest — except for the part where multibillion-dollar international conglomerate PepsiCo tries to steal photos from naive consumers just for the privilege of entering its contest. Entries from 12:00:01 a.m. ET Dec. 29, 2012 to 11:59:59 p.m. ET Jan. 11, 2013 will be entered in the sweepstakes portion of the contest with a chance to win the Super Bowl halftime show prize package, with a drawing taking place on or about Jan. 12, 2013. For an additional 10 days after the sweepstakes portion of the contest ends, entrants can still submit photos for possible inclusion in a Pepsi Super Bowl commercial. I thought about entering this one myself just for grins (Beyoncé, Super Bowl, New Orleans, free airfare and free money — what’s not to love? ), but then I did something most people entering the contest probably won’t bother doing: I read the rules. The photo contest portion of the promotion is what really makes me cringe, so let’s take a look at the official rules for the Pepsi Super Bowl halftime show contest. Say what?! Access for the halftime show but not the game? That’s incredibly lame. 13. Grant of Rights to SPONSOR. a. In consideration of entering a Submission in the Promotion, Entrant on behalf of themselves, their heirs, executor, administrator and assigns, hereby assign to SPONSOR all rights, interest and goodwill in the Submission, including an irrevocable grant to SPONSOR of the exclusive, perpetual, royalty-free, worldwide license and right to broadcast, exhibit and/or otherwise use the Submission and every element thereof, in whole or in part, in any manner or medium now or hereafter known or devised, including but not limited to the possible use of the Submission by SPONSOR in advertising. All Submissions, upon submission, become the property of SPONSOR, and each of their successors, assigns and licensees. SPONSOR will have the exclusive right to make unlimited derivative works therefrom, to assign or transfer any or all such rights and to grant unlimited sublicenses and make any edits or modifications to Submission. Without limiting the forgoing, SPONSOR will have the right to use the Submission in any merchandising, advertising, marketing, promotion or for any other commercial or non-commercial purpose. Entrant forever waives and relinquishes on behalf of themselves, their heirs, executor, and administrator and assigns any and all rights, including but not limited to goodwill, in and to the Submission. Entrant also irrevocably grants SPONSOR the right to use their name, voice, likeness and biographical material in or related to the Submission. Entrant agrees not to issue any publicity on behalf of or in connection with SPONSOR, their Submission and/or their participation in this Promotion. b. Entrant acknowledges that they have no right of approval or consultation with respect to SPONSOR’s use of the Submission. SPONSOR will not be responsible for the return or preservation of the Submission. SPONSOR shall use their sole discretion in determining the extent and manner of the use of the Submission and SPONSOR are not obligated in any way to use or exploit the same or any rights granted by Entrant, or any portion thereof, in any medium or any manner whatsoever, including but not limited to use on SPONSOR’s website. Entrant further agrees that the Submission is not being submitted in confidence or in trust, and that no confidential or fiduciary relationship is intended or created. Entrant further acknowledges and agrees that by entering their Submission, they warrant that the Submission is their original work. c. Entrant acknowledges that, upon entering their Submission, SPONSOR own and control all rights, including but not limited to the copyright, intellectual property, goodwill in and to their Submission and hereby irrevocably grants to SPONSOR the unconditional and perpetual right and permission to trademark, copyright (as appropriate), reproduce, encode, store, copy, transmit, publish, post, broadcast, display, publicly perform, adapt, exhibit and/or otherwise use or reuse (without limitation as to when or to the number of times used), the Entrant’s name, address, image, voice, likeness, statements, biographical material and Submission, including, but not limited to, advertising, as well as any additional photographic images, video images, portraits, interviews or other materials relating to the Entrant and arising out of his/her participation in this Promotion (with or without using the Entrant’s name) (collectively, the “Additional Materials”) in any media throughout the world for any purpose, without limitation, and without additional review, compensation, or approval from the Entrant or any other party. If you enter the Pepsi Super Bowl halftime show photo contest, Pepsi can do whatever they want to with the photo(s) you enter — even if you don’t win. They can keep doing it forever and they’ll never give you a dime. If you enter the Pepsi Super Bowl halftime show photo contest, the photos you enter aren’t yours anymore — they become the property of Pepsi and Pepsi only. If you decide later you’d like to use one of the photos you entered in the contest on your Facebook profile or print out a copy to send your mom, you’d be breaking federal law if you didn’t obtain permission from Pepsi first. In that event, Pepsi could actually sue you for copyright infringement. Sure, I realize the odds of that happening are pretty slim, but ask yourself this: If Pepsi would never do something like that, then why would Pepsi insist on having the right to do it in the first place? It’s perfectly fine to give away something of value (a photo) in exchange for something else of value (a trip, experience and money), but Pepsi’s rights-grab doesn’t do that — it takes things from people just because they enter a contest and that’s fundamentally wrong. I’m also not convinced it’s even legally enforceable since a transfer of copyright requires a contract and a contract requires consideration (both parties exchanging something of value). Where’s the consideration here? Pepsi gets your photo, but what do you get? The privilege of entering? I’m no lawyer, but that doesn’t seem like legitimate consideration to me. At least if they decide to use a photo you entered in their Super Bowl commercial, they’ll compensate you with a coupon for a free 12-pack (a $4.99 value!). That’s a bit insulting considering PepsiCo can spend $3.5 million or more to buy commercial airtime for Super Bowl XLVII, but it’s better than nothing. Be smart: Don’t let Pepsi (or any other photo contest sponsor) trick you into giving away something for nothing. Regardless of whether you’re a professional photographer or an amateur, your photos still have value. If they didn’t, why would a multibillion-dollar corporation like PepsiCo be trying to steal them from you? Don't fall for a questionably-legal Pepsi Super Bowl halftime show photo contest ripoff being foisted on unsuspecting football fans.